The UserControl is a very interesting class of Catel, and fully shows the power of the MVVM Framework that ships with Catel. The user control is able to fully integrate MVVM on a user control level and solves the “nested user control” problem, which is explained in detail a bit further in this documentation. It simplest thing to do is to create a view model that has an empty constructor (thus without parameters). If the UserControl is added to the visual tree, the view model is instantly constructed and available for usage. A view model that is used inside a UserControl implementation is exactly the same as the DataWindow implementation. This way, the developers don’t have to worry about whether they can currently writing a view model that is meant for a window or a control. A bit harder (it’s still very easy, don’t worry), but much more powerful is the construction with a parameter. This way, a control is forced to use the data context to create the view model. If there is no valid data context that can be used to construct the view model, no view model will be constructed. This sounds a little abstract, but let’s take a look to a more meaningful example. /// Initializes a new instance of the <see cref="CompanyViewModel"/> class. /// Initializes a new instance of the <see cref="Company"/> class. In the image above, you see 2 controls. 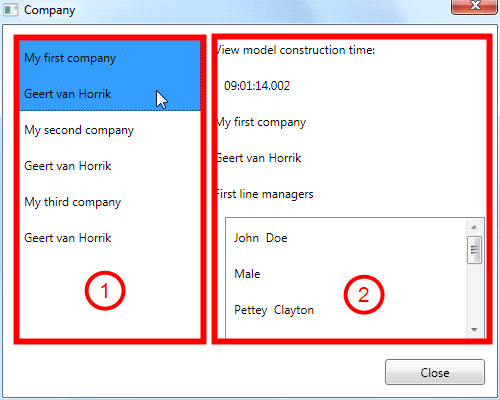 The first one is an items control that binds to the CompaniesViewModel because the window represents list of companies. The second one is the CompanyControl, which dynamically constructs the CompanyViewModel as soon as a company is selected at the left. This means that for every company selection, and new view model is constructed. This way, you can handle the saving, canceling and closing of the view model before the next is view model is constructed. The best thing about this is that you can actually start re-using user controls throughout your whole application. Instead of having the main view model have to define all the properties of (sub) controls, now each control has its own view model, and you don’t have to worry about the implementation in the parent of a control. Simply set the data context of the user control to the right type instance, and the user control will handle the rest. When developing custom user controls, you still want to use the power of MVVM, right? With Catel, all of this is possible. All other frameworks require a developer to manually set the data context on a user control. Or what about mapping user control properties from/to the view model? Two way, which means that either the control or the view model will update the values of the other party as soon as they are updated. When this value is used, nothing happens when the view model of the user control changes. This way, it might be possible that the values of the control and the view model are different. The first one to update next will update the other. When this value is used, the value of the control is used when the view model of the user control is changed, and is directly transferred to the view model value. When this value is used, the value of the view model is used when the view model of the user control is changed, and is directly transferred to the control value. The mapping is from the control to the view model only. The mapping is from the view model to the control only. The UserControl automatically closes view models in the Unloaded event. Reason for this is that there is no guarantee that the control will be loaded again. However, this can have some negative side effects. On of this side effects is a user control shown as a tab in a tab control. One of the behaviors of a tab control is that it unloads all non-active tabs from the visual tree. Therefore, the UserControl cancels and closes the view model. However, the state of the tab is lost then as well. To prevent this behavior, it is possible to keep view models alive when a user control is unloaded. This can be done by setting CloseViewModelOnUnloaded to false. This way, the view model is not closed and will be re-used when the control is loaded again. The downside of this is that the responsibility of closing and disposing the view model is now in the hands of the developer. A great way to make a difference between unloading (tab switch) and closing is to create a close button on the tabs that will explicitly call ViewModel.CloseViewModel.